Whitechapel is far more entertaining than it has any right to be. The series, which follows the investigation into a series of Jack the Ripper copycat killings, is derivative in nearly every conceivable way, from the gory details of the murders (borrowed from history) to the mismatched pair of detectives at the center of the story (borrowed from every cop movie and/or television show ever, basically). Aesthetically, Whitechapel is Fincher-lite: The bilious color palette ranges from pea green to piss yellow, and there are lots of jarring transitional devices and lurid close-ups of people slicing into slabs of meat. Yet despite its lack of originality and occasional lapses into serial-killer kitsch—or maybe because of these things—Whitechapel is also pretty irresistible, a meta murder mystery about our curious habit of using the suffering of others for entertainment. When we first meet Detective Inspector Joseph Chandler, he’s decked out in a tuxedo and swilling brandy with a group of high-ranking police officers at a tawny gentleman’s club. Played by the swoon-worthy Rupert Penry-Jones (the most comically English name of all time), Joe has his eyes on becoming police commander. In an act of flagrant nepotism, he’s assigned to oversee the investigation into the murder of a woman in Whitechapel—the East London neighborhood made infamous by Jack the Ripper. Once the investigation is complete, he's guaranteed a promotion into a cushy job at headquarters. Naturally, the case proves to be anything but the cakewalk Joe had in mind. 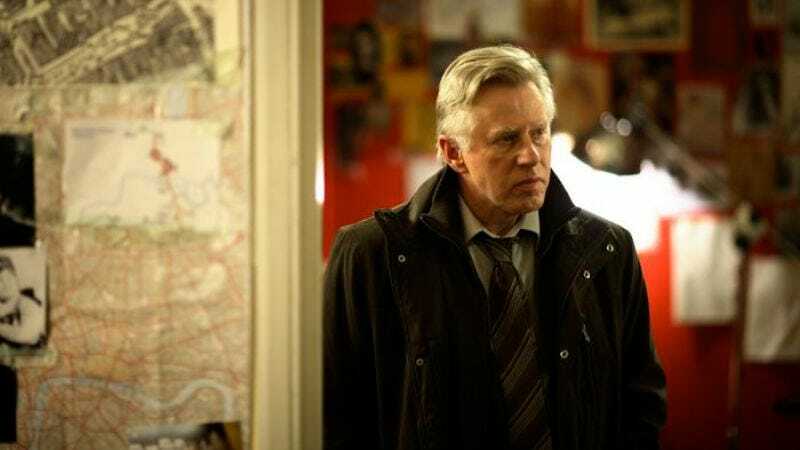 Joe arrives at the scene of the murder and instantly clashes with his sergeant, Ray Miles, played by the wonderful Phil Davis, a veteran of Mike Leigh’s films. Predictably, Joe gags when he sees the woman’s mutilated body—what a ponce, right? Ray, hard-bitten vet that he is, is unfazed by the gruesome scene. The mismatched-detectives trope is as at least as old as the cop show itself, and there’s very little that’s original or groundbreaking about the Joe-Ray pairing. It works quite well, in a pleasantly formulaic way. Miles is the cynical veteran with the thick Cockney accent, Joe is the posh new guy who doesn’t understand the macho culture of the homicide squad; he drinks green tea and is impeccably groomed, while they drink lager and forget to put on deodorant. I hope I’m not giving away too much when I say that, despite their initial dislike for one another, Joe and Ray eventually form an understanding. At first, the case appears hopeless: There’s no forensic evidence, no witnesses, and the dead woman’s sleazy ex-husband has a rock-solid alibi. But Ray and Joe get their first break when Edward Buchan, a self-professed Jack the Ripper expert, suggests the murder was modeled on that of Mary Ann Nichols, the notorious serial killer’s first victim. The date, details, and neighborhood are the same; surely it can’t be a coincidence? Ray, who’s disgusted by “Ripperologists,” is instantly dismissive of the theory, but Joe, desperate for a lead no matter how implausible, decides to pursue the theory. As the series progresses, Buchen’s theory bears out, and this is when Whitechapel really starts to get interesting. In an attempt to outwit the murderer, the detectives all become amateur Ripper experts. Whitechapel works perfectly well as a stylish procedural, but it’s also a basic primer on the Ripper killings: You learn about the various suspects, about the Ripper’s victims, about the (frequently ludicrous) debates between Ripperologists. As I watched Whitechapel, I frequently found myself pressing the pause button, not because I was bored, but because I wanted to Google various bits of information about the original case. Like many people, I’m both intrigued and repulsed by serial killers, and I’ve always been fascinated by Jack the Ripper. The series is about a copycat killer, but it’s also about the cottage industries spawned by the Ripper: the books, the websites, the tours. Over the years, the killer has softened into an object of Victorian kitsch. One thing Whitechapel does is to remind us (sometimes a little too vividly) of how horrible his crimes really were. In an almost Hitchcockian way, Whitechapel indulges our obsession with murder while also indicting it; one character even declares that “murder is not entertainment.” Of course, all the moralizing is a little disingenuous: The makers of Whitechapel know perfectly well that, like it or not, murder is entertainment. Otherwise, why tune in?